Russell N. James III is Professor & Director of Graduate Studies in Charitable Financial Planning at Texas Tech University. He’s a great friend, and I’m one of his biggest fans. Dr. James is a diligent researcher with a nose for sniffing out the most relevant data for nonprofit fund development. So, whenever Dr. Russell N. James III publishes a major research paper on fundraising, everyone in the profession should sit up and take notice. Sitting in a Seattle restaurant about six years ago, Dr. James and I were discussing his next research project. What I had come to believe from anecdotal evidence and my experience, Dr. James has demonstrated with careful quantitative research. 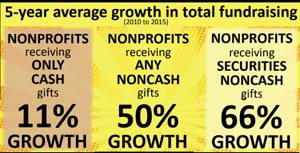 His latest research paper was posted in February of 2018 under the title, Cash Is Not King for Fundraising: Gifts of Noncash Assets Predict Contributions Growth. It’s impossible to fully explain Dr. James’ finding in a 1,200-word blog, but I’ve listed below a few of the most astounding elements of his paper. I encourage you to follow the link to the full-length paper. Dr. James’ paper analyzes data from 1,055,917 nonprofit tax returns (IRS Form 990) filed electronically for the tax years 2010-2015. The objective was to explore the correlation between various gift types reported by organizations as compared to total donations reported in the succeeding years. The research question was this: Would the type of donations (cash-only, non-cash gifts, and/or securities) become a predictor of the future growth or future decline in overall fund development? Of all the Form 990 returns filed in 2010, 8,927 nonprofits reported total contributions in excess of $1 million in 2011. Those organizations were divided into three categories based on the types of gifts reported. CATEGORY 1: Over a five-year period (2010-2015) there were 2,548 nonprofits that reported ONLY CASH donations. CATEGORY 2: In that same period there were 4,236 nonprofits that reported having received a combination of CASH and NON-CASH donations (real estate, paintings, and other assets convertible to cash). CATEGORY 3: The third category was the 2,143 organizations that reported having received donations of CASH and NON-CASH, as well as SECURITIES. It turns out that there is indeed a strong correlation between donations types organizations received in a given year and the growth or decline in total donations in the following years. Specifically, organizations that reported only cash gifts grew an average of 11% while those reporting gifts of cash and non-cash donations grew at a 50% rate, and organizations that received cash, non-cash, and securities experienced a 66% growth rate. Other data analyzed in Dr. James’ report shows that these trends were consistent regardless of the size of the organization. Conversely, when the share of an organization’s type of donations changed, so did the average income from donations. For instance, if in a given year CASH donations to a particular nonprofit increased 10% or more, on average the total contributions declined 13% in the following year. When the SECURITIES share of contributions increased 10+ percent, the total contributions increased 18% in the next year; and when the share from NON-CASH donations (e.g. real estate) increased by 10+ percent, the total contribution went up an average of 26%. In other words, greater success (or a greater emphasis) on raising CASH in a given year produced less total contributions in the following year. REASON #1: Soliciting Gifts from Net Worth Rather than Discretionary Income. I’ve been making this case since 1981 when as a young fundraiser the Chief Development Officer at Pomona College outlined it for me on a napkin (see The Case for Endowments). Typically, a family’s cash accounts are used to manage the flow of income and expenses. Whatever is left over at the end of the month becomes the family’s discretionary spending—and discretionary giving. Approximately 3% of family wealth is held in cash accounts; the majority of the remaining 97% is real estate and securities. Fundraisers who appeal almost exclusively for donations from the 3% pot are like the poor during the Depression—standing at the backdoor asking for leftovers or spare change. REASON #2: Expanded Categories. When donors make non-cash charitable gifts (especially first-time gifts from assets), their gift opens the door to a wide range of giving possibilities. Their response to a future solicitation might be to consider a dozen ways to give rather than the one way—cash from their 3% pot. Fundraisers who appeal almost exclusively for donations from the 3% pot are like the poor during the Depression—standing at the backdoor asking for leftovers or spare change. REASON #3: Gearing Up to Appeal. In his concluding remarks, Dr. James deals with the issue of causality. Demonstrating a correlation between factors A and B doesn’t necessarily prove that A caused B. Perhaps it was B that caused A, or there was a factor C that caused both A and B. One possible reason that total contributions radically increased in the following years is that a greater emphasis on non-cash donations caused fundraisers to “gear up” in their abilities to explain and solicit those types of gifts. In that case, it was a factor C (e.g. a leadership commitment) that caused B (greater ability to explain and facilitate non-cash gifts) and A (increased non-cash gifts). Dr. James points out from a fund development standpoint, it really doesn’t matter which factor caused the other. The only concern for nonprofits is that total contributions dramatically increased in organizations that reported receiving non-cash gives and declined when the share of cash gifts increased 10+ percent in a given year. REASON #4: A Far More Effective Giving Strategy. Gifts from appreciated assets eliminate the capital gains tax liability on those assets. Consequently, it’s a more efficient and effective giving strategy. All strategic donors with high giving capacities are fully aware of this. However, that same strategy can work for those with limited assets who may be reluctant to give from investment or retirement accounts. 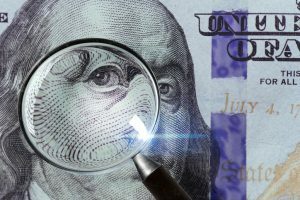 While accumulating enough assets to live on in retirement is the primary concern for these donors, the more remote but equally relevant concern is the capital-gains tax liabilities on those appreciated investments. While accumulating enough assets to live on in retirement is the primary concern for these donors, the more remote but equally relevant concern is the capital-gains tax liabilities on those appreciated investments. A highly effective giving strategy for these donors is an asset replacement swap. Take the example of a habitual giver who has donated $100 per month to an annual fund for as long as anyone can remember. If that donor gave securities from appreciated assets valued at $100, then purchased $100 worth of those same securities with the dollars they had intended to give to the annual fund each month, the result is that the donor would be systematically reducing their capital gains liability by $100 each month. That is an effective giving strategy for donations of $100 or $1 million in appreciated assets and serves as a strong motivator for donors at all giving levels. These were just a few of the reasons Dr. James offers to account for the extraordinary correlation between types of gifts and future growth of overall fund development. Other reasons include the financial reference point of accumulated wealth versus disposable income; and the perception of earned versus unearned wealth (appreciated assets as “found money”). Soliciting donations of non-cash assets is in most cases a win-win for both donors and nonprofits. Yet, it’s baffling to me how frequently I come across organizations that solicit only cash donations from that 3% pot of discretionary spending. It seems to be either the foresight of organizational leaders; the extra effort required for non-cash gifts; or in some cases not recognizing or rewarding fundraisers of non-cash gifts. In other words, organizational fundraisers focus in on cash because it’s simple and easy. In this case, however, simple and easy does not equate to the efficient and effective giving strategy employed by the best fund development programs. Thank you Eddie for bringing clarity to what Dr. James’ research is helping us understand. I look forward to hearing/seeing you in Charleston, SC next month. Excellent article Eddie! Very timely as well as the observations found herein are especially useful in my current situation! Thank you!! Eddie — you are one of the most perceptive thought leaders in philanthropy. Thanks! Thanks for this great summary! The final version of this research has now been accepted by a peer-reviewed academic journal and will be published in final form soon.